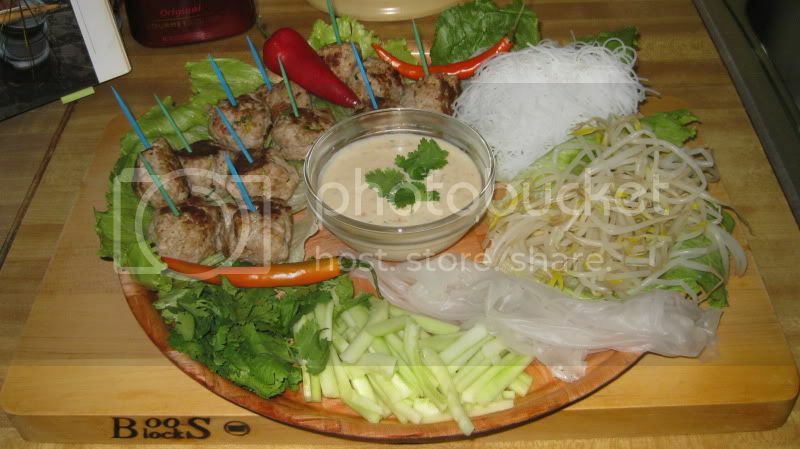 Rec: Nem Nuóng (Pork Meatballs Served in Salad Rolls). This was a delicious treat! I made this over the Labor Day Weekend. See my notes at end of recipe and Link URL for photo as it appeared in cookbook. 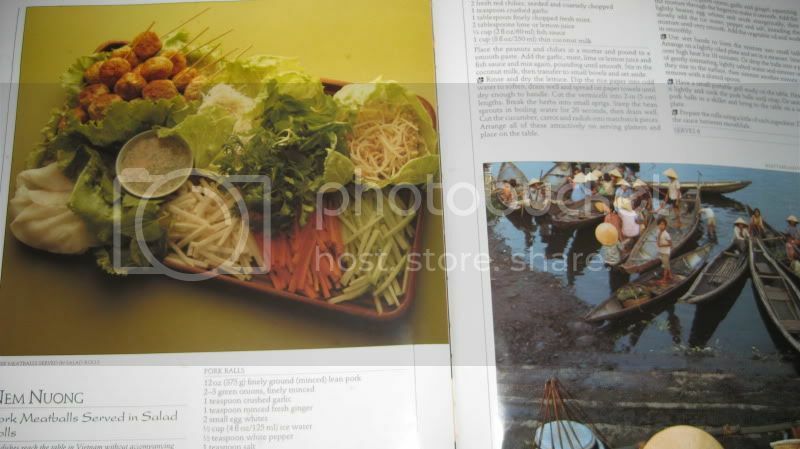 Few dishes reach the table in Vietnam without accompanying salad vegetables or a profusion of herbs. Many dishes are made up of a small basic meat dish such as meatballs, tiny stuffed beef rolls, slivers of barbecued beef, or fish purées. These are served with a mix of lettuces, mint and other herbs, bean sprouts, cucumber, radish and carrot and wrapped together in round sheets of edible rice paper. The resultant roll is then dipped in an aromatic sauce based on various combinations of roasted crushed peanuts, fish sauce and garlic. Nem nuóng are small balls of smoothly ground pork that are first steamed or simmered, then cooked at the table on small portable broilers until crusty and well colored. They are then popped into the rice paper and lettuce roll with a selection of accompaniments and eaten sandwich style. Place the peanuts and chilies in a mortar and pound to a smooth paste. Add the garlic, mint, lime or lemon juice and fish sauce and mix again, pounding until smooth. Stir in the coconut milk, then transfer to small bowls and set aside. Rinse and dry the lettuce. Dip the rice paper into cold water to soften, drain well and spread on paper towels until dry enough to handle. Cut the vermicelli into 2-in (5-cm) lengths. Break the herbs into small sprigs. Steep the bean sprouts in boiling water for 20 seconds, then drain well. Cut the cucumber, carrot and radish into matchstick pieces. Arrange all of these attractively on service platters and place on the table. Mix the pork, green onion, garlic and ginger, squeezing the mixture through the fingers to make it smooth. Add the lightly beaten egg whites and work energetically, then slowly add the ice water, pepper and salt, kneading the mixture until very smooth. Add the vegetable oil and work in smoothly. Use wet hands to form the mixture into small balls. Arrange on a lightly oiled plate and set in a steamer. Steam over high heat for 10 minutes. Or drop the balls into a pot of gently simmering, lightly salted water and simmer until they rise to the surface, then simmer another minute and removed with a slotted spoon. Have a small portable grill ready on the table. Heat, oil it lightly and cook the pork balls until crisp. Or sauté the pork balls in a skillet and bring to the table on a serving plate. Prepare the rolls using a little of each ingredient. Dip into the sauce between mouthfuls. I made the pork balls and sauce the night before serving. I sparingly used two medium/large egg whites in a teacup for the pork balls. Using my talc-free vinyl medical gloves, I quickly formed the balls and placed them on Styrofoam plates to chill for a few minutes in the fridge. They tend to be very soggy but once I plopped them in the boiling water, they formed rather nicely. for 15 seconds) and prepared the veggies. I used two 8-inch rice wrappers that I had on hand. They tore on me so I just made my “wraps” and used a knife and fork. There is a typo in the cookbook. It reads 2 rice papers but of course you can use as many as you want. The pork balls were delicious and the sauce was sooooooo yummy! I just used what veggies I wanted but prepared the recipe as written for the pork balls and sauce. It’s a bit of work so I would suggest doing the pork balls and sauce the night before like I did. Next time, I’m going to use lime juice for the sauce.